Like mosquitoes attacking you in the woods after a hard rain, the rigors and responsibilities I’d accumulated over the years were stinging me from every direction and on just about every part of my body. I knew I needed a break. I escaped to North Cascades National Park for a solo overnight. The ranger gave me a site he said he personally loved and I made my way to peel apart the layers of my defenses to rediscover who I was beyond the tasks that had too oft come to define me. When I arrived at the site, it was epic: a mixture of tranquility, loneliness, and natural cacophony. 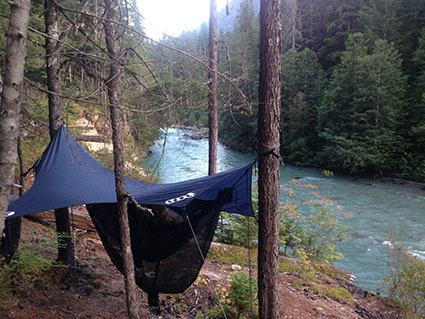 I hiked to the side of a cliff 20 feet above a roaring river and leapt with giddy excitement—there were plenty of perfect trees to hang my Doublenest Hammock. My pack hit the forest floor and my arms immediately pulled out hammock, Dry Fly, and the coup d’etat, the Guardian Bug Net. So, I quickly slung the simple bug net over the hammock and synched the ends. Quick and easy setup for fool-proof protection against the ever-present flying blood-suckers. The night came and so did the bugs, but I knew their onslaughts were in vain. Rest eventually came and not just in the physical sense. Being in that place with the opportunity to sleep but also to take a deep breath mentally and emotionally was a bandaid on a weary soul. I know it’s oversimplification to say that the bug net played the only role in that rest, but it was such an important, unheralded role. I wanted to give its just due. By now, I've used the Guardian Bug Net all over the U.S. and the effect has always been the same: piece of mind. It is the number one inhibitor of rest when I have the wonderful chance to sleep in my hammock for the evening. And I’ll keep using it, as it has turned my hammock into something so much more beautiufl than even it was before.